After toying with my open office software and with Microsoft, too, I finally was able to make a mock magazine cover, only to find blogger didn't accept it. Thus, I had to search the internet for a way to convert to a jpeg image and, la, you see the product below. Note to all: I found this image of Lizzie Bennet on google images. No copyright infringement is intended. Why did I even do this? Well, I thought it would be fun. 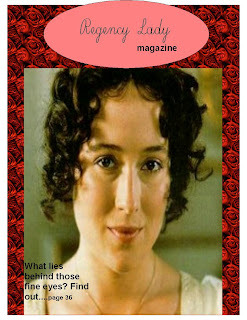 Imagine a fashion and personality magazine dedicated to the women of Jane Austen's novels. Who should be the first cover girl? For the prototype I chose Lizzie. But who do you feel would best be featured in a Regency edition of Vanity Fair or Vogue? Who would you most like to have do a fashion shoot and interview? Sort of an enjoyable 'what if' kind of question and, so, I pose it to you. For GBBS's second poll, I ask you to be the editor and decide....(The poll is at the sidebar.) Feel free to add comments here about your selection. There is no character named Victoria in this novel. All this allusion to VS would not be completely out of left field, for Lauren Willig's The Secret History of the Pink Carnation has some, ahem, provocative moments. Beware, there are some such lingering scenes. So you're happily plowing through the novel and then - Whoa, baby!- there's a truly intimate interlude. A few times. Parents, teachers, readers inclined to blush easily - just wanted to let you know. With all that said allow me to continue about this contagiously entertaining novel. It begins all innocence and fun scene-setting in England and France, a sweet little tale apparently written on the side by a Harvard law student, very girlie. And it pretty much stays that way throughout the book save for those handful of pages previously discussed. There are few, if any, swears in this novel, or any other sort of verbal vulgarity. This is not a scary book - suspenseful at times, as befits a novel of espionage - but none of the grotesque elements so often found in pop culture today. And, now that I've mentioned the spy business, I should clarify that this is the cartoon version, not at all to be taken seriously, fun for it's ridiculousness. This playful novel could not, after all, be the book it is if it took itself seriously. It is light on true espionage, heavy on romance, highly imaginative - how did Willig come up with such a detailed floor plan for Edouard's house? - and populated with characters which are familiar and original at the same time. Reading it you feel you've met them before, in a '40s film or somewhere, but haven't had the pleasure of their company for a few years as most writers seem to take a more prurient and/or darker slant with their stars and supporting players. It's refreshing. Basically, the main character, Amy, decides in Regency England that she wants to join an espionage ring in France. In another plotline, we have Eloise, a modern-day scholar who is studying Amy's diaries which form the entree into Amy's world. The writing is of the effervescent ginger ale variety in its sweetness and levity, risque sections notwithstanding. The book doesn't masquerade as more literary than it is, but it is intelligent fluff. So, decide if you're more a G, PG or R rated reader, and proceed from there. If you read it, enjoy, if not, there's always many more books on the shelf. I've added a poll, so please feel free to share your opinion on what qualifies as a good book with a bright side. The poll closes at noon on September 22. So much more enjoyable than the general election! Don't you think so? Jemmie, tired of classes and scholarly work, lingered at the bargain bin at the college B&N after standing in the book buy-back line for a solid hour and a half. After a few slow yawns she shook her head and determinedly set her jaw into a no-yawn position; but she simply found her nostrils expanding when her body experienced the next sleepy impulse and she was finally forced to admit that, yes, she needed rest. Then she spied it. She knew her reluctance to leaving the store without spending a bit of that textbook money on a nice novel or two existed for some reason. Could this book be as promising as it looks? 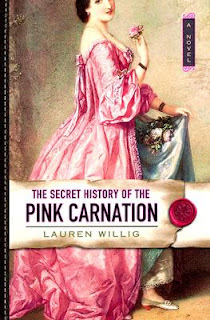 The lady living on the cover of The Secret History of the Pink Carnation carried such a flower in her delicate alabaster hands and the folds of her equally pink gown cascaded over her slippered feet. The book was branded with a blushing wax seal. How perfect could a cover be? But could the words inside match the promise of the outside? She'd seen the book before but assumed it was just more of the same silly chick-lit and bad writing she'd seen so much of before in stores. That money was really wriggling around in her wallet impatient to be spent. She was yearning for a bookish cash transaction - my money, your book then your money, my book - resulting in a purchase carried home in a nice green bag after a few witty words with the cashier about the state of popular literature these days. But did Jemmie live happily with that book or did she regret the indulgence of that buy? NO REGRETS! This bears repeating. The book purchase was not a bad idea. So keen on her novel find was Jemmie that she consented to have her experience romanticized by her book-blogging alter ego, Jemima. But surely you're wondering now how a review would go. Jemima is going to transcribes Jemmie's feelings right here on GBBS. How d'ya like them apples an' oranges? It seems some screenwriter has taken the lovely Pride and Prejudice by Jane Austen and based a fantasy called Lost in Austen on it. Now, I'm straying a bit, just a bit, from the topic of books because Lost in Austen is a television program; but, with its literary roots it seems an appropriate tangent to explore. After thinking so much about the unfortunate-but-oddly-fun-at-the-same-time Lost in Austen, I thought back on the book Austenland by Shannon Hale. They're really quite similar (a romance in a regency-esque environment) as so many JA knock-offs tend to be, but I recently blogged about its relatively good taste.This stands in such dire contradiction to some aspects of the new Lost in Austen that I selfishly thought I'd ask JA lovers and readers a question or two: How do you compare or contrast the arguably more innocent Austenland (which has had its own criticisms of being too tame) and the arguably racier Lost in Austen? Granted, I realize this is an apples and oranges situation, with one being a television production and one a novel, but as they are both related works of writing I thought, why not? Is Austenland too innocent to be believable? Is Lost in Austen a bit vulgar at times? Jemima here. I have a confession. Remember the time sophomore year when you assigned The Scarlett Letter to us. I read the first chapter, ie pages 1 and 2, was stricken by the image of the rose but felt much like I would normally feel in high school - like I'd rather be watching Mystery on PBS. So I did. And remember when you assigned Bernard Malamud's The Fixer? I read it in between points at a tennis match. And remember when you assigned To Kill a Mockingbird? I read it! This is big because most of what you assigned went unread by this particular student. You see, for a lover of books - even then a lover - I went through stages, and this stage was the Black Hole, the Bermuda Triangle, the Star Trekkian force field stage which ate up any hope of literary growth. Ah, the books I could have read and enjoyed, the progress my brain's right hemisphere might have made, the influences I missed that could have molded me at that possibly critical period of writerly development - all gone. It is with regret that I look back on the reading non-experiences of my high school English career. All right, I wrote that great short story. All right, I learned some valuable grammar. But the books! The discussions I might have taken part in! The quizzes I would have aced! Granted, these are not exactly what I might now call 'Good Books with a Bright Side,' but they are classics and necessary to some degree in a healthy literary diet to produce a robust, well-balanced body of reading. A reader should probably know something about these books. To speak intelligently about them, reading helps. So, dear high schoolers of today, there are good reasons you are being asked to read certain books. And you have an opportunity now to engage in vigorous debate and interesting discussion that we adults salivate over the thought of and which we form book groups to attain. This, during hectic lives when reading is a luxury. And you get to do it for your work! How many forty-year olds would love that? Many, I can assure you. Now, if you're reading this blog, I might just be preaching to the choir, but at least I put my unfortunate reading past into words. Whew, what a load off!